In the future Scandinavia and the rest of Europe will be connected by the world's longest road and rail tunnel. The fixed immersed tunnel link across the Fehmarnbelt will be more than 18 km long and carry a four-lane motorway alongside a twin track-electrified railway. The fixed link will reduce the travel time between Scandinavia and Continental Europe. At a speed of 110 km per hour, this will offer motorists a journey time of approximately 10 minutes through the tunnel. For train passengers, the journey will take seven minutes from coast to coast. The duration of a train journey between Hamburg and Copenhagen will be cut short from about four and a half to merely three hours. 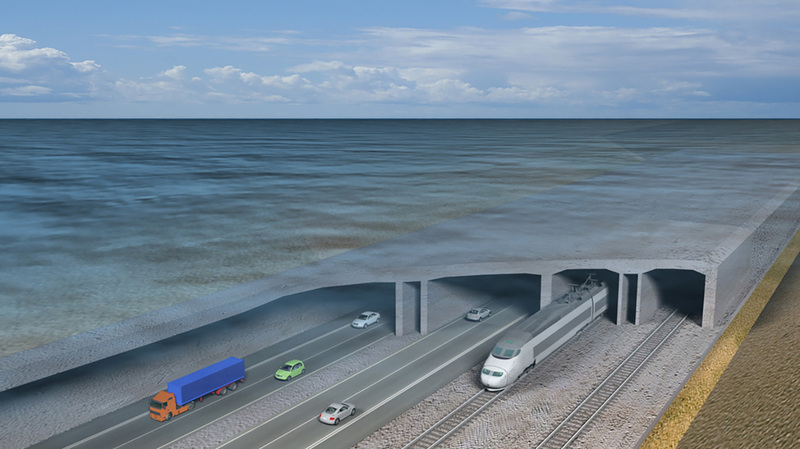 The immersed tunnel solution under Fehmarnbelt is a study in innovative thinking, as it challenges existing tunnel building standards. It improves functionality through its pioneering longitudinal ventilation system and state-of-the-art safety and security features. The Fehmarnbelt tunnel will be more than five times the length of the tunnel under Øresund linking Denmark and Sweden, and more than three times the length of the Trans-Bay Tube Bart Tunnel in San Francisco in California, the current world record holder. In close collaboration with Tunnel Engineering Consultants (TEC) og Arup, Ramboll is advising Fehmarn A/S on the design of the immersed tunnel solution. Ramboll is main consultant on Fehmarn belt, one of the world's biggest projects with immersed tunnels. Read more about how we solve this and other world class immersed tunnels projects. Visit Femern Sund Bælt's website to read more background about the project and see their many videos and visualisations. At the recent International Tunnelling Awards 2013, a team of innovative experts from Ramboll won the “Ground Investigation and Monitoring Award” for the "exceptional geotechnical consultancy work" on the Fehmarn Fixed Link project.